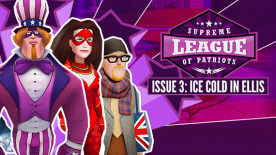 Now an official Manhattan superhero, The Purple Patriot is still searching for his ticket to the big time. So when he learns of a siege at Wilson Chase bank, he realizes this is exactly the opportunity he's been waiting for. Forced to battle his own prejudices as much as terrorists, he sets about finding out who is behind the attack. A careless mistake, however, leaves him at the mercy of a former- friend and leaves the entire USA in peril.